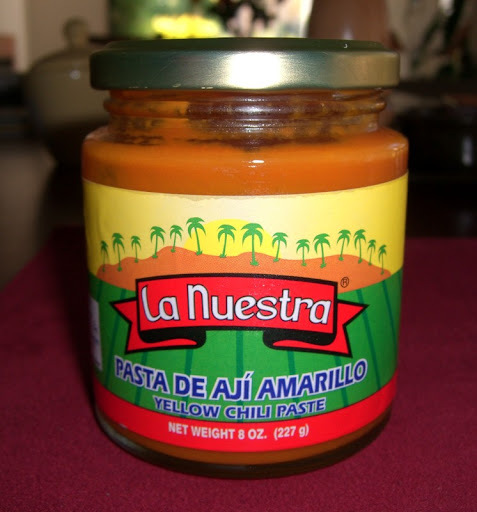 We bought a jar of aji paste a while back at Northgate Market to use for making anticuchos. Since we only used a little bit of the paste (it is very concentrated stuff), we wanted to come up with some other uses for it. 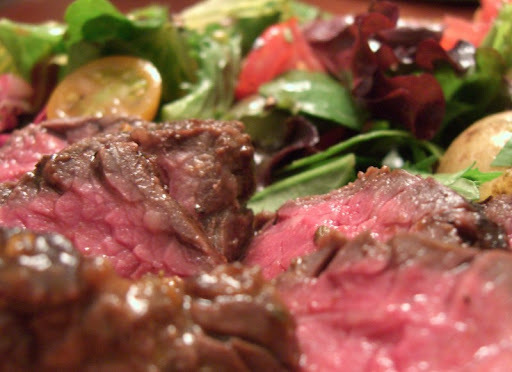 Turns out that it makes a very nice marinade for hanger steak. 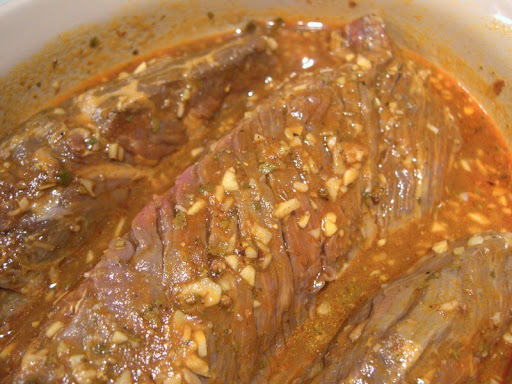 We used the same marinade we used for the anticuchos. We cooked it up on the barbecue, keeping it nice and rare (which is important with hanger steak -- it doesn't do well if you cook it too hard). It was fantastic -- the aji complemented the slightly gamey flavor the of the meat really well. 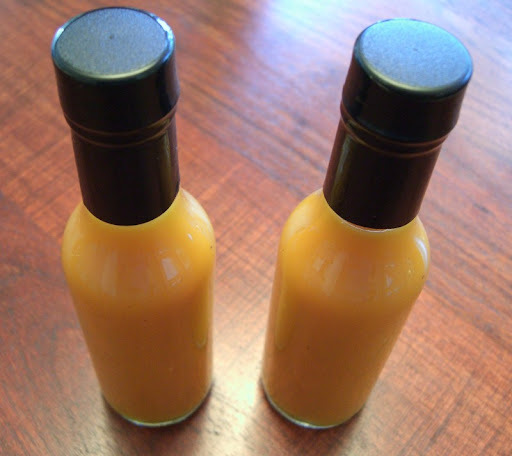 Since we've made hot sauce from our red chiles a bunch of times, we decided to experiment with a yellow hot sauce using the aji paste as the base. Instead of mellowing it with roasted red pepper, we roasted some yellow peppers instead. The result was interesting, but more mild than we would have liked. We plan to try again -- maybe omitting the yellow peppers. Don't mess with my Pliny! 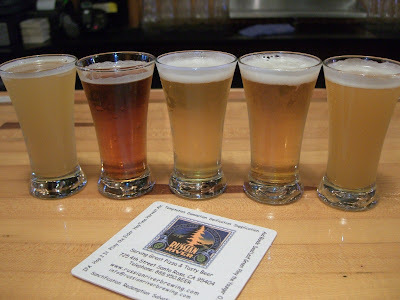 After visiting Sierra City, we spent a couple of days in Santa Rosa with brewery visits at the top of our todo list. 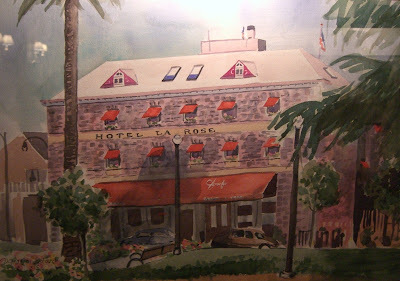 We stayed at the Hotel La Rose, which was a great place and also conveniently located. 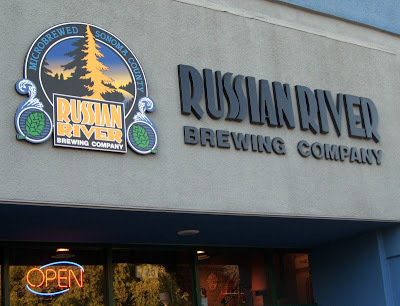 Located within stumbling distance of Russian River Brewing Company, that is. When we aren't drinking local San Diego beer, Pliny the Elder holds one of the top spots on our hit list. It helps that the Liars' Club almost always has it on tap. 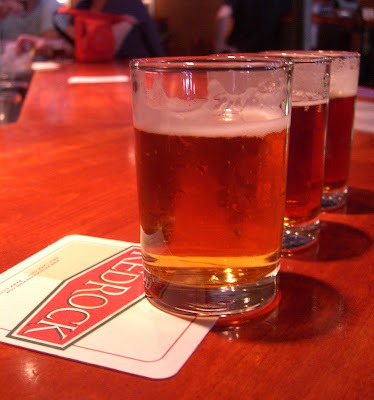 At the source, however, you can get pints of Pliny and its little brother, Blind Pig for $2.75 during happy hour. It's pretty hard to beat that. 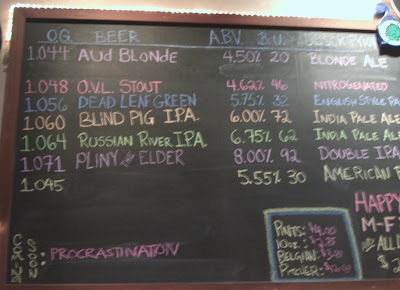 You've got to love the first column on their beer chalkboard listing original gravity. Less to love was the service at the brewery. It is a surprisingly large and busy place, and was understaffed during our visit. Vinnie, I loves me the Pliny, but I think I'd rather drink it at my local. Less easily obtained in my neighborhood, we also sampled the five Belgian style beers they had on tap. We are acquiring a taste for Belgian yeast, but aren't quite there yet. Our favorite of the bunch was the Damnation. We weren't in the mood for the food at Russian River (they basically just do pizza), so we stopped into Josef's, the restaurant in our hotel, and shared three appetizers. We had a smoked chicken dish, mussels, and some escargots. All three were very good, but we particularly liked the chicken. They also had quite reasonably priced wine by the glass. 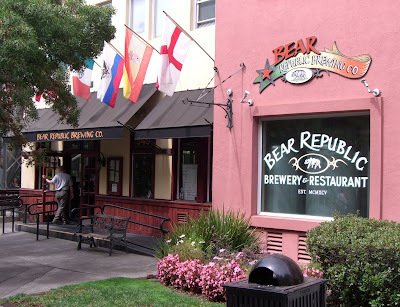 The next day we did a short road jaunt up to Healdsburg to visit Bear Republic Brewery. We liked the atmosphere here much better than at Russian River. 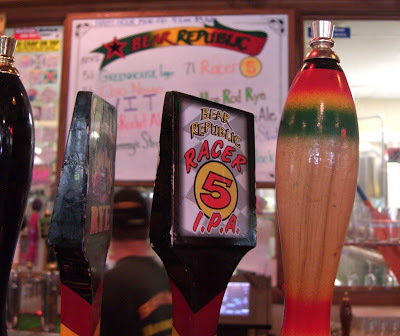 Their Racer 5 IPA is one of the first aggressive IPAs we ever tasted, and remains one of our favorites today. It was great to have a pint of it on its home turf. While we were there, we ran into two other couples on similar beer pilgrimage circuits and engaged in some serious beer-geek conversation. 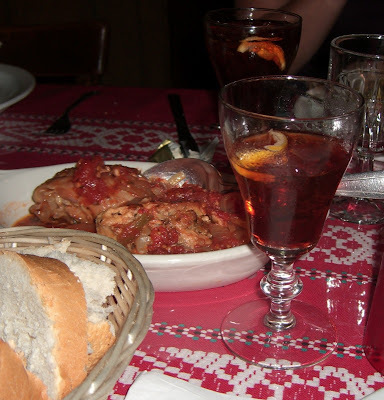 That evening, we again had dinner of appetizers. This time we visited a wine bar called Wine Spectrum just around the corner from our hotel. 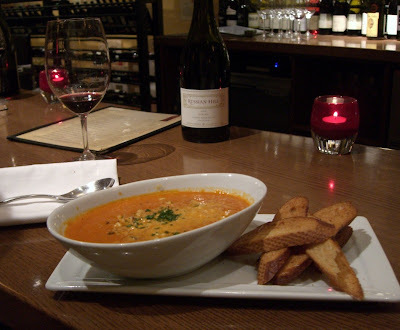 Our favorite dish was this heirloom tomato soup. 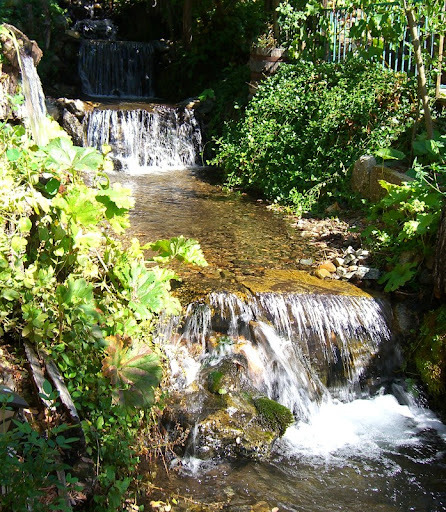 During our Sonoma visit, we also hit up several wine tasting rooms in the area. We were mostly appalled at the trend of the more successful wineries charging more and more for tastings ($10 was not uncommon). 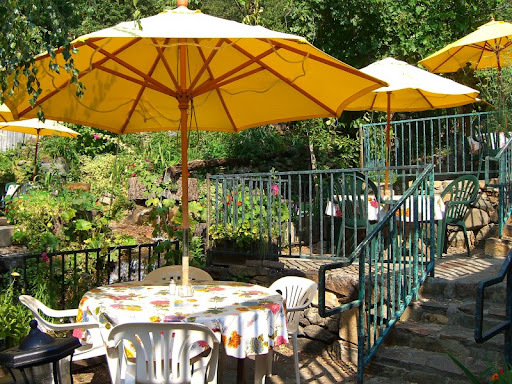 We did have a few pleasant stops, however, the best being at Kendall Jackson (right off of the central square in Healdsburg) and Seghesio (a short walk to the edge of town). In both cases the people pouring were both friendly and knowledgeable. One of the downsides of living in a condo is the lack of space to grow a garden - our outdoor real estate is limited to a small patio. Choosing what to grow is key. No zucchini here. Potatoes? Forget about it. 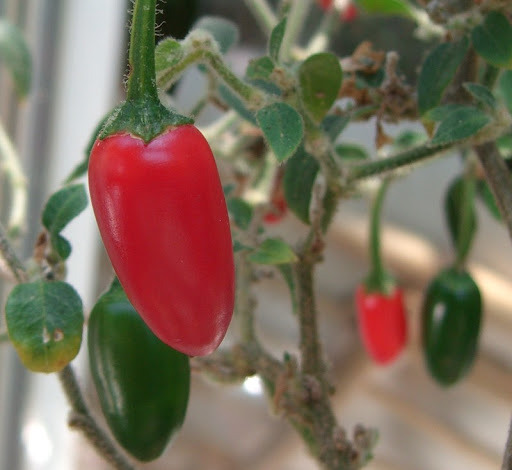 We grow herbs, some small tomatoes, and of course, chiles. 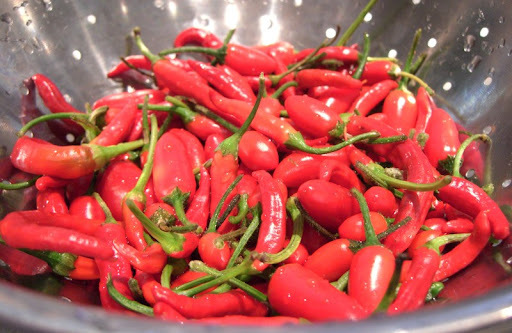 It is really convenient to have a local source of chiles when we need one or two to add heat to a dish we are making. We never use them all up that way, however, so we always end up with a bunch left over and in need of a purpose. 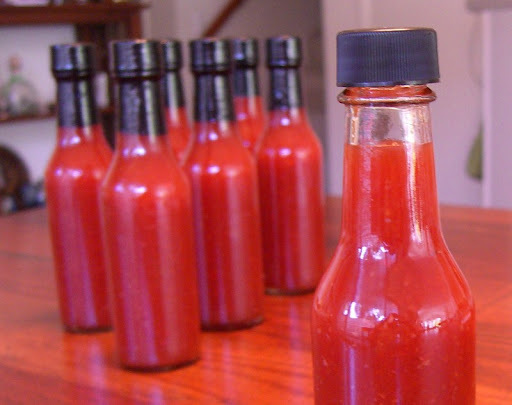 And what better purpose than Hot Sauce? Today we've got serranos (normal sized and tiny), ceyenne and thai bird chiles. Seeds can make the sauce bitter, so I removed them from about half the batch. Blending them up in the food processor with some onion, garlic and roasted red bell pepper adds body and mellows things out. 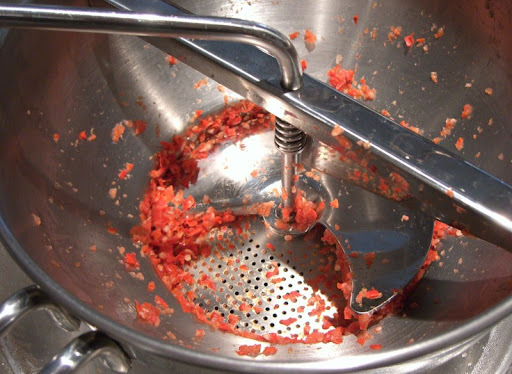 Running it through a food mill gets rid of any big chunks of skin or seeds. We like to add plenty of vinegar to thin out the consistency and add a nice zing. Cooking it a few minutes sets the flavors and sanitizes the sauce. Then all that is left is bottling. We get our bottles online from Leeners. 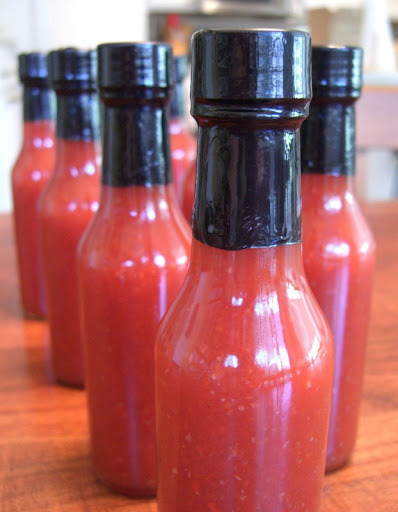 Our hot sauce recipe is constantly evolving based on the year's chile harvest and our current hot sauce needs. The recipe below is fairly mild with a lot of vinegar twang, so use a vinegar you find tasty. 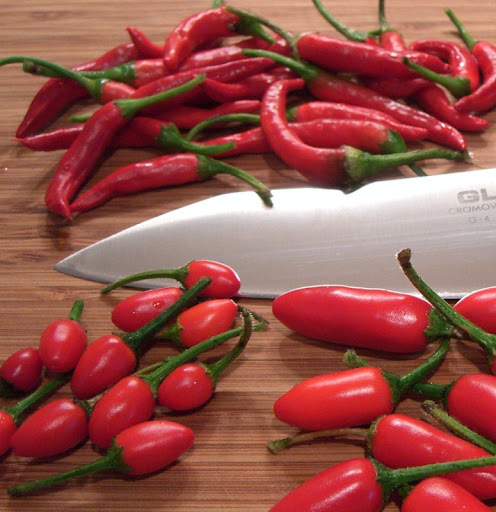 To make a real kicker, leave out the roasted bell pepper and reduce the vinegar and onion by at least half. Makes about 7 5-oz bottles. Rinse the chiles and drain well. Cut off the chile stems and discard. Cut chile lengthwise and remove the seeds (leave some in for additional heat). 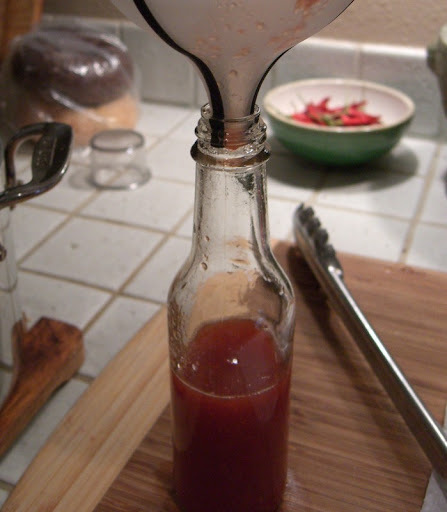 Bring 1 cup red wine vinegar to a simmer and blanch the chiles 4-5 minutes to soften. Set aside to cool. Roast the red bell pepper until the skin is charred. When cool enough to handle, remove and discard the skin, seeds, core, and stem. Place the flesh in a food processor along with the onions and garlic cloves. Add the blanched chiles and process to a fine puree, adding some of the blanching vinegar to loosen the mixture if necessary. 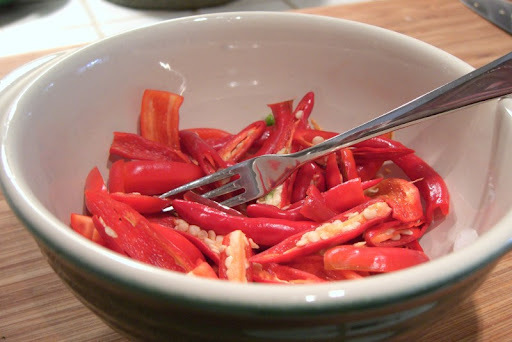 Pour the chile puree into a saucepan and blend in the remaining vinegar. 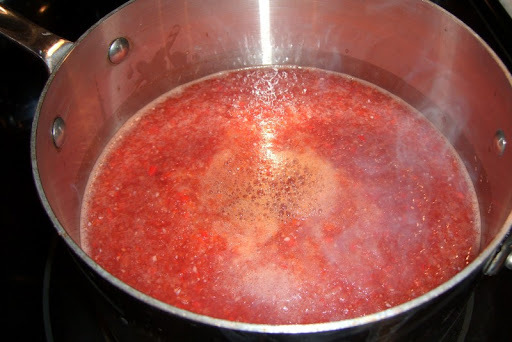 Bring to a low simmer and cook gently 15 minutes. 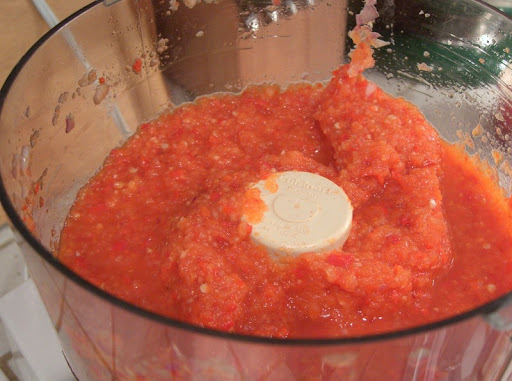 Run the cooked puree through a food mill or strainer to remove large pieces of skin and seeds, then return the strained hot sauce to the pan and simmer another 5 minutes to sanitize. Transfer to clean, sterilized bottles. (Detailed instructions for safe handling and storage can be found at Leeners.com). 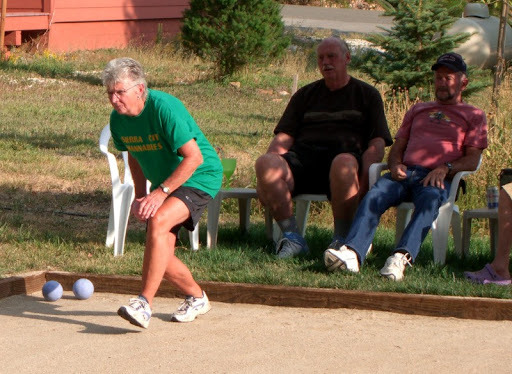 While hanging out at the Buckhorn Tavern in Sierra City, we received an invitation to the weekly Sunday bocce match in town. 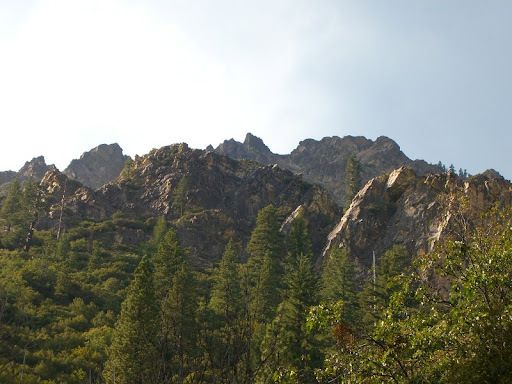 It was a beautiful September afternoon, so we walked up the road to the scene of the engagement with great views of the Sierra Buttes along the way. This court is one of three (!!) in the area. 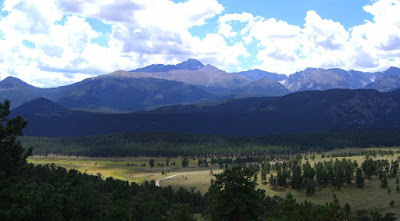 You can't complain about the mountain view in the background. Sherry and I got in on the action (after official league play was over, of course) and managed to avoid embarrassing ourselves too much. On our last night in town, the restaurant was closed but Joanne was hosting a dinner for the local Lions Club. 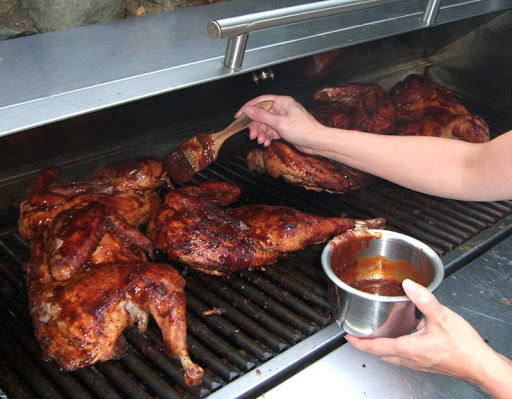 The main course was to be barbecued turkey, which we (ok, mostly Sherry) were enlisted to cook. Joanne's restaurant cook seemed unconvinced of the advisability of the barbecued turkey idea, and I admit that we had our doubts as well, but they came out perfectly. 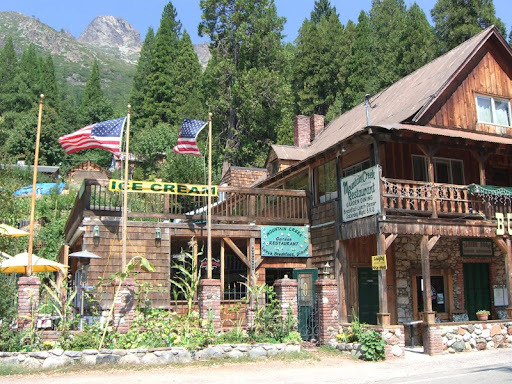 A highlight of our road trip was hanging out with some of Sherry's family at their restaurant in Sierra City. 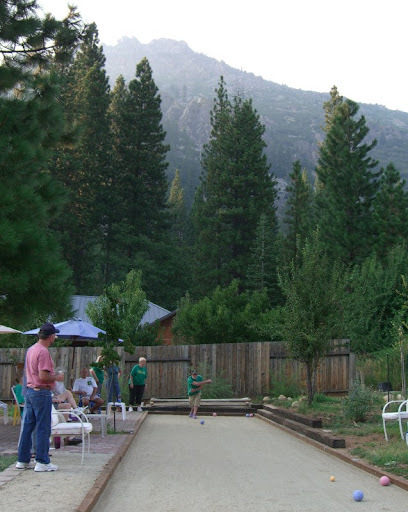 Mountain Creek Restaurant at the Buckhorn is in a terrific location, only about 90 minutes from Lake Tahoe or Reno and not much further from Sacramento. From outside you can see the Sierra Buttes up in the distance and they have a beautiful outdoor seating area with a creek running down the middle. Joanne, Sherry's step-mom does most of the day-to-day management and is assisted by Sherry's sister, Sierra and Dad, Dennis. 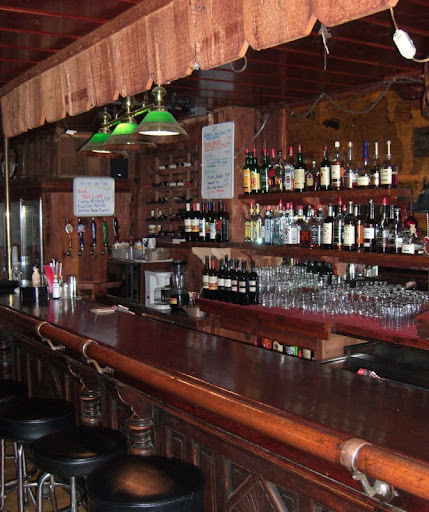 They also run the Buckhorn Tavern -- a full bar with a number of beers on tap (including the mandatory Sierra Nevada). 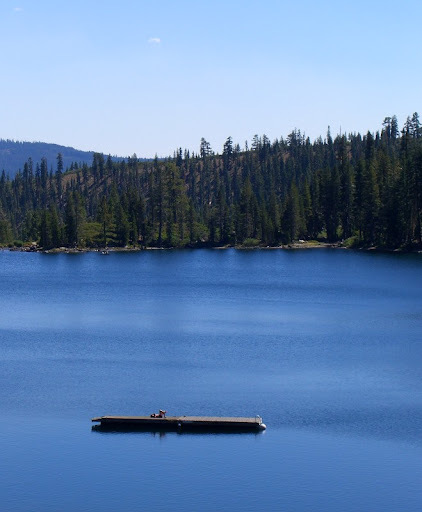 Sierra City is surrounded by a bunch of small lakes. 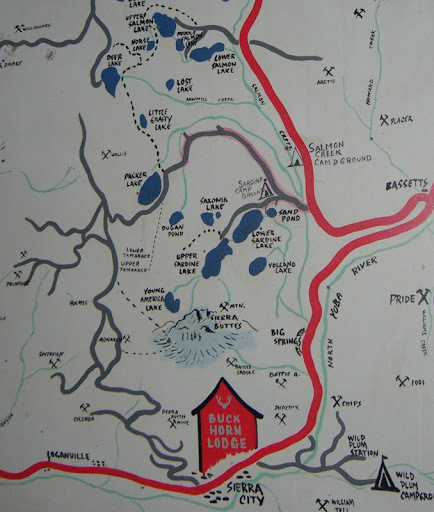 As you might expect, fishing and hiking are both popular activities in the area. 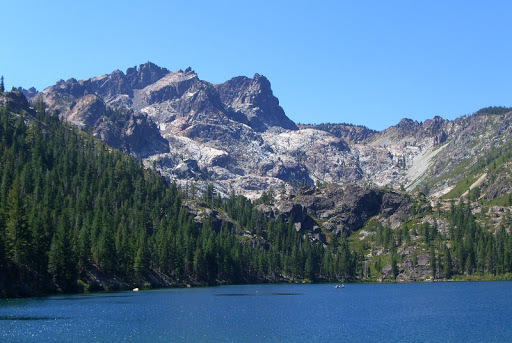 On a perfect sunny Saturday, we visited a few of the lakes with Sherry's Dad (Joanne and Sierra were busy at the restaurant and missed out on the gorgeous hikes). 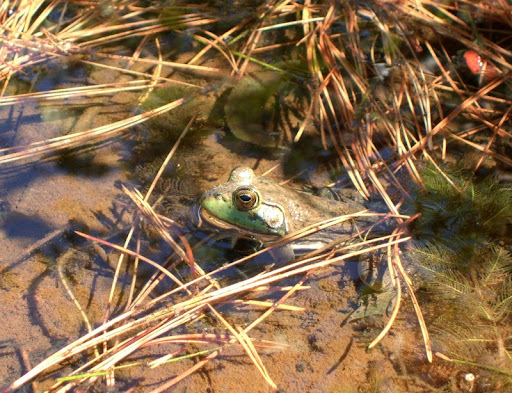 We also managed to spot some wildlife. This guy wasn't shy about having his picture taken. After our hikes we sampled the restaurant's Saturday special, barbecued ribs. They were great -- almost falling off the bone. Unfortunately, we were so caught up enjoying our visit that we neglected to take any photos of family or food... We'll try to make up for it next time. 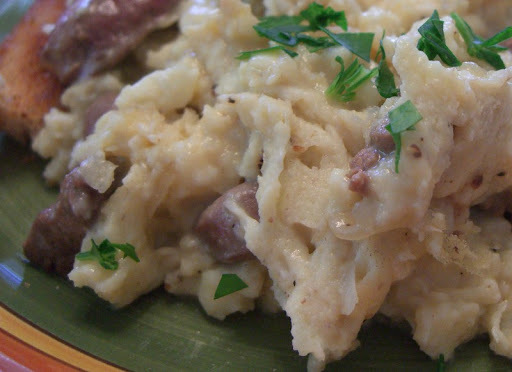 We had giblets sitting in the fridge from the smoked chicken we made a few days earlier, and for some reason this diabolical idea came to me -- Offal Eggs. We cooked up the liver and heart like we normally would for a snack (sauteed in a little butter), whipped up some scrambled eggs, and mixed the two together. 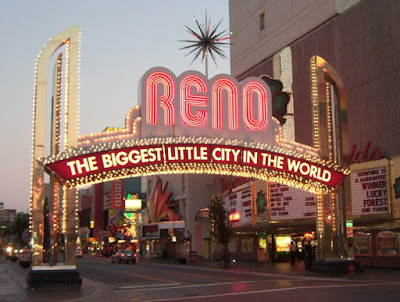 We overnighted in Reno on our way up to the Sierras. 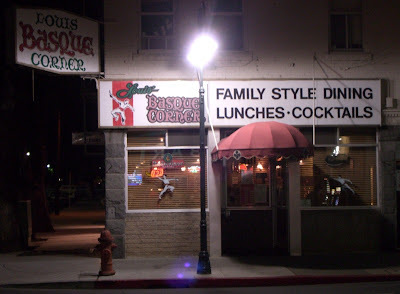 We had considered stopping in Elko because we had heard that there was good Basque food there. Instead, we ended up there around 3pm hoping for lunch. We found the Basque places -- three of them are within a block of each other on Silver Street. Unfortunately, they all closed at 2. The Star Hotel even had their hours engraved in a wooden plaque by the door, so we figured they were pretty set in their ways and we were out of luck. Fortunately, as we were searching our GPS for places to eat in Reno, we found a Basque restaurant just down the street from our casino hotel. 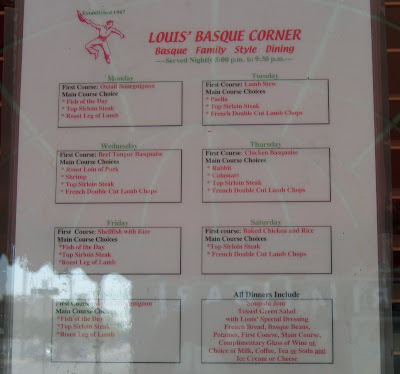 And so, we ended up dining at Louis' Basque Corner. Their menu rotates daily, with each day featuring a set first course and a selection of other dishes to order. 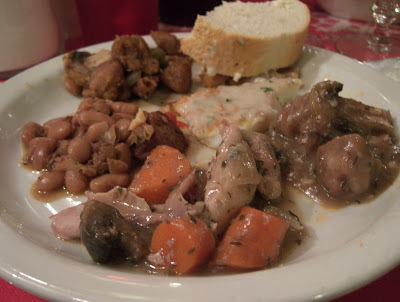 It was Thursday, so the first course was Chicken Basquaise, and the choices were Rabbit, Calamari, Top Sirloin Steak and Lamb Chops. In addition, they had two (!!) different styles of Sweetbreads available. 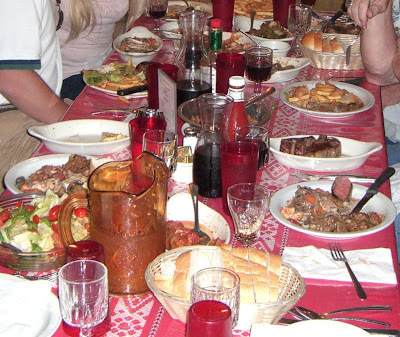 Between the six of us at our table, we ended up ordering each of the main courses available that night. Which resulted in a bit of mayhem at the table as dishes were passed around. 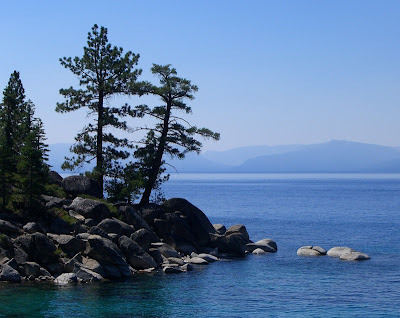 The next morning we stopped off at Lake Tahoe on our way up to Sierra City. It was a beautiful sunny day, and we did some hiking around the lake. 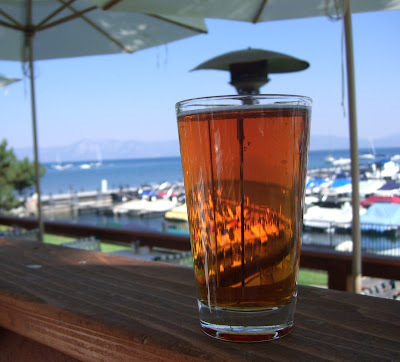 We stopped in at Jake's in Tahoe City for lunch (a very good bowl of gazpacho and a nicely cooked, but under-seasoned ono sandwich) and a pint of Sierra. Before leaving the copious Colorado beer selection behind us, we stopped in a liquor store (grocery stores can't carry alcohol in Colorado) for some supplies. 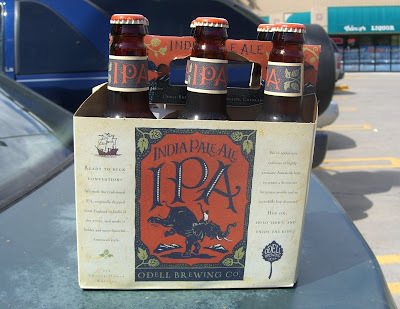 This IPA from Odell ended up being our favorite Colorado beer after those made by Great Divide. 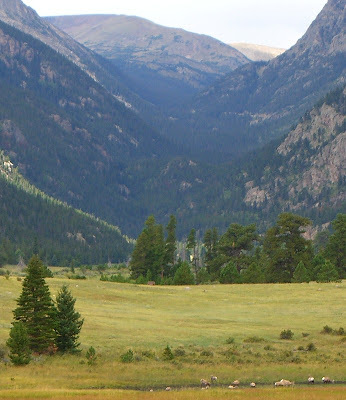 We stayed overnight in Rock Springs. It was surprisingly difficult to get a hotel for the Tuesday after Labor Day in the middle of nowhere. During dinner at Bitter Creek Brewing (I had the Mustang Pale Ale, which was ok), a guy told us that oil and natural gas were hot at the moment, causing a lot of activity in the region. 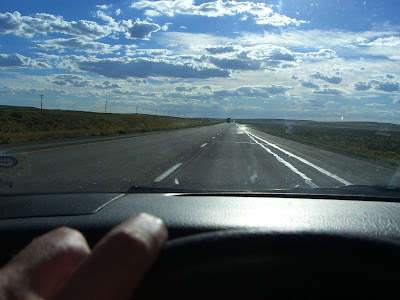 The next day we kept on west to Salt Lake City. Downtown SLC has a very strange vibe to it. The streets are very wide, which kills any kind of intimate downtown feel. 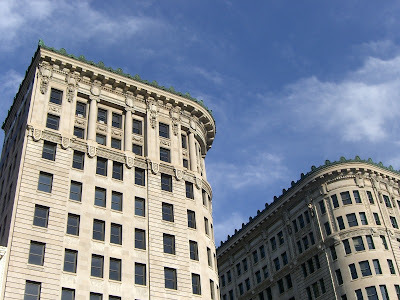 There are lots of interesting old buildings, but much of the street-level spaces are recently empty. I'm not sure if the businesses failed or if the buildings are just in need of serious renovation. Regardless, they area did not have a very vibrant feel. 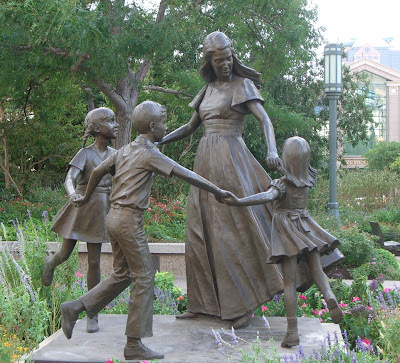 The dominant feature of downtown is, of course, Temple Square, the center of activity for the Church of Jesus Christ of Latter-day Saints. 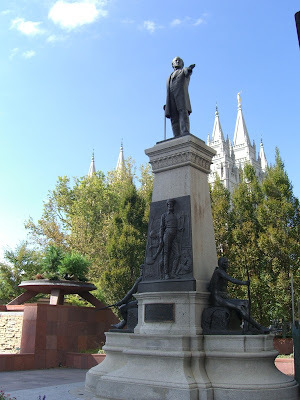 Brigham Young stands at the edge of the square. 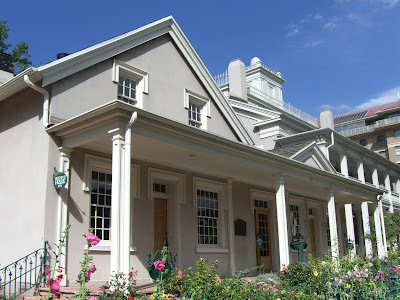 We took a somewhat bizarre tour of the Beehive House (Brigham Young's residence) given by two Asian Mormon missionaries (one from Japan and one from Korea). As we wandered around the square, we saw that these international missionaries were everywhere, offering free guided tours as a means to get "face-time" with prospective converts. Despite the church influence in the city, you can still get a pint and there are a number of microbreweries in town. 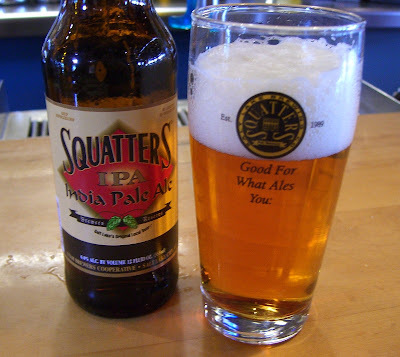 We first visited Squatter's and had their IPA. 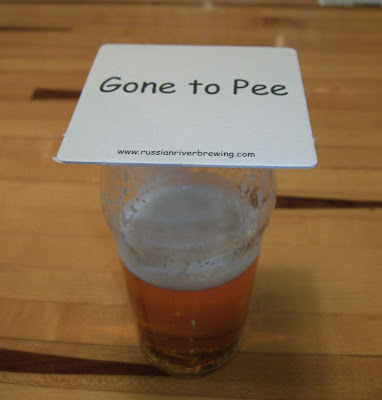 In order to have that particular beer, we had to move from the bar area to the restaurant proper. Utah liquor laws are pretty strange. They can only serve beers up to 4% on tap. Anything over that needs to be served in a bottle -- the brewery's restaurant purchases it that way like anyone else. We also stopped at Red Rock Brewing Company, which we preferred to Squatters both in atmosphere and beer selection. My favorite was the Roggen Rock, a rye beer. Eggplant and heirloom tomato napoleon. Very pretty. The tomatoes were great, but the eggplant was a bit boring and stiff. Halibut cakes with a tomato fennel relish and saffron cream. These were more croquette than cake, but the fish was great. We didn't really notice the other flavors much, though. Antipasti with prosciutto, braseola, coppa and fontina. The braseola was fantastic and the prosciutto was good, but we found the flavor of the coppa much too strong. Braised lamb and chorizo over mascarpone polenta. Great comfort lamb flavor and the polenta was a perfect accompaniment. Duck breast and braised pear with gorgonzola currant sauce. Probably our favorite. The duck was cooked perfectly and the currant sauce was wonderful. The pear had just the right consistency. All in all, a really good meal. 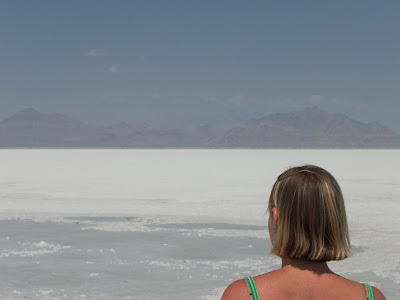 On the way out of the city the next morning after a nice breakfast of Kouing-aman and plum tart at Les Madeleines, we stopped at the Bonneville Salt Flats, which as advertised were both salty and flat.